Sept 16 - This was the day we borrowed the cage for Jinxy! I was so worried that my husband would hate the idea but I really hated that Jinx was locked in that bathroom. I figured the cage would make him part of the family until we could figure out what to do about his hip. My husband actually helped my daughter take the cage into the living room. She had taken it from the truck to the house. He saw her and told her he would take it. 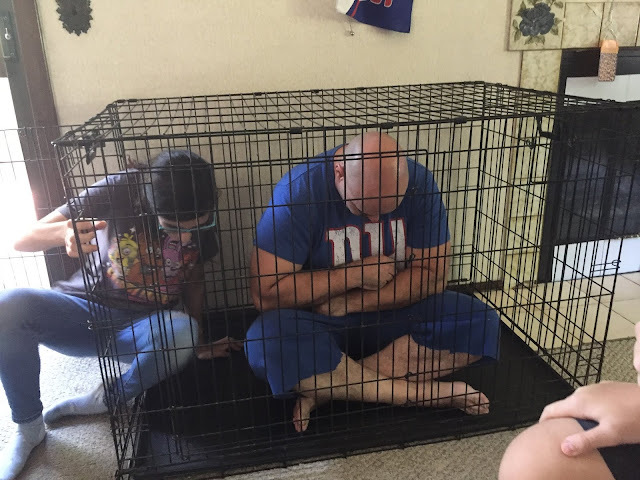 He then set it up and even got in stating that if the Giants lost again we would find him taking the L Train to the cat cage! Not what I had expected at all. I thought it would be too big and take up the living room. It was nice to see we were all on board to be with Jinxy. 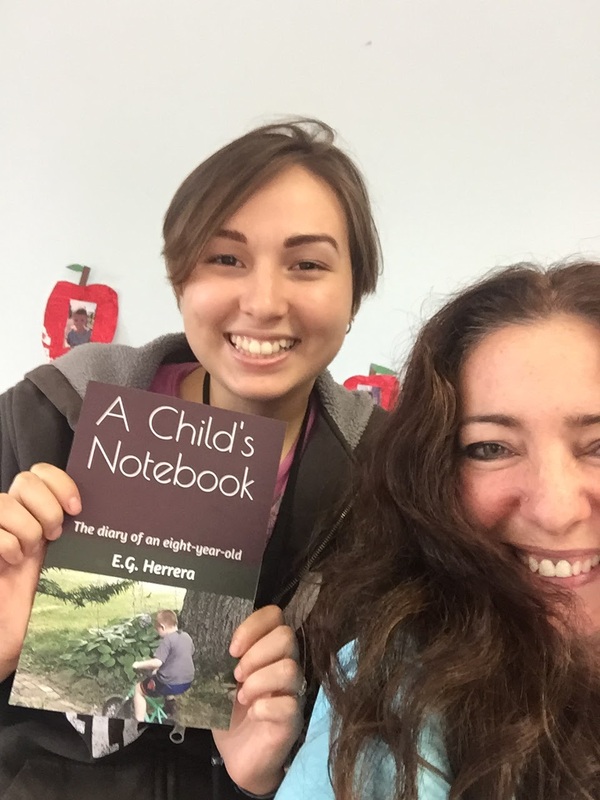 Sept 17 - My co-worker wrote a children's book. It is really good. See my review post here. Sept 18 - Jinxy and his new home! He is part of the family again and we couldn't be happier. 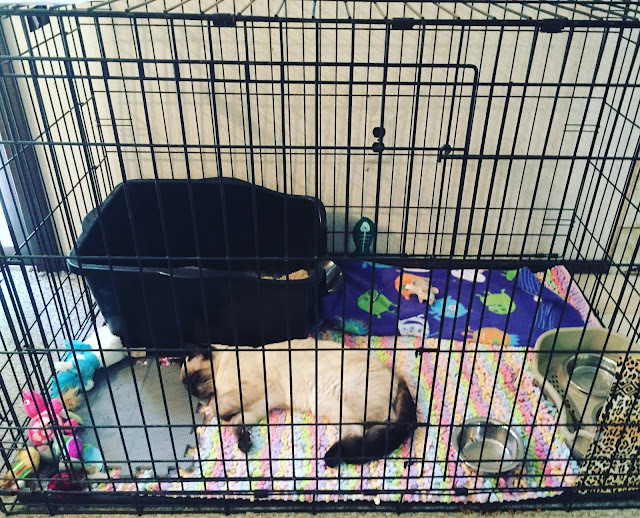 Sept 19 - Jinxy's cage keeps getting updated. 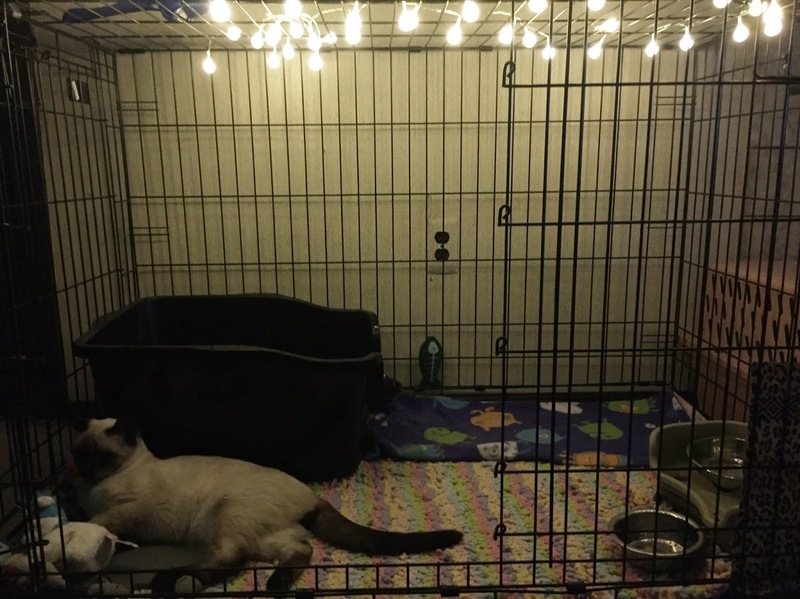 This time he got some ambient lighting. Even with the cage open Jinxy doesn't try to make a run for it. It is so sad to hear him in pain. I hate the sound he makes when he tries to stand up. 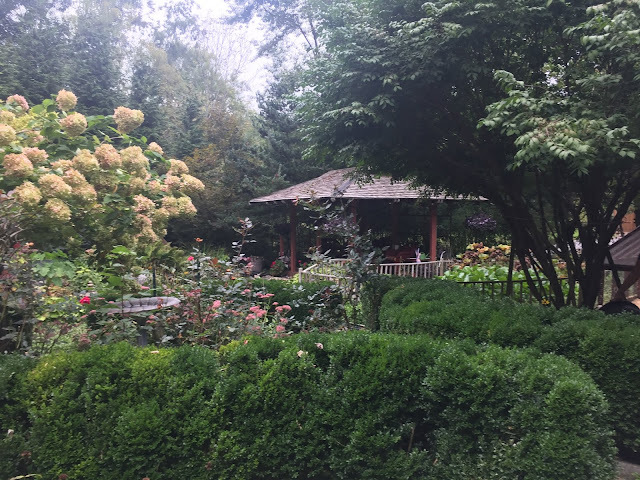 Sept 20 - We are duck, Koi, cat and garden sitting for a family. I think this is our 5th year. They live in a beautiful place, we get paid really well, they are so sweet and we get to walk among these gorgeous grounds for a while. What is not to love? Sept 21 - Caught in mid yawn. 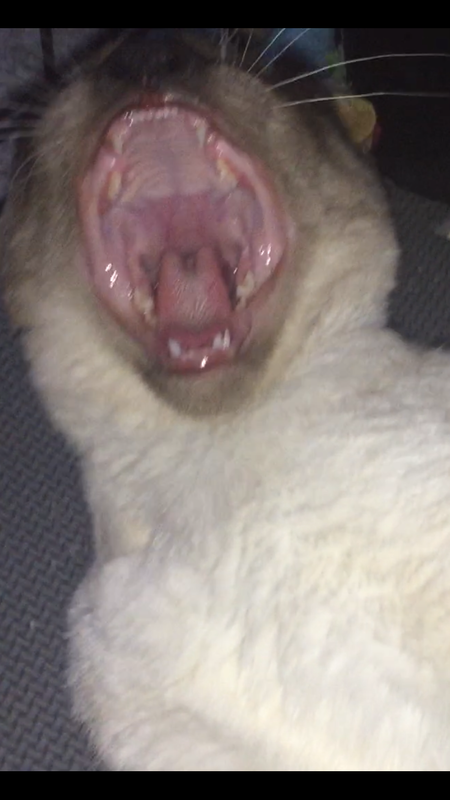 Look at Mr. Jinxy's mouth. Two teeth on the bottom. Eventually one will fall out. He is too cute. Sept 22 - Ms. Split Stitch is back! 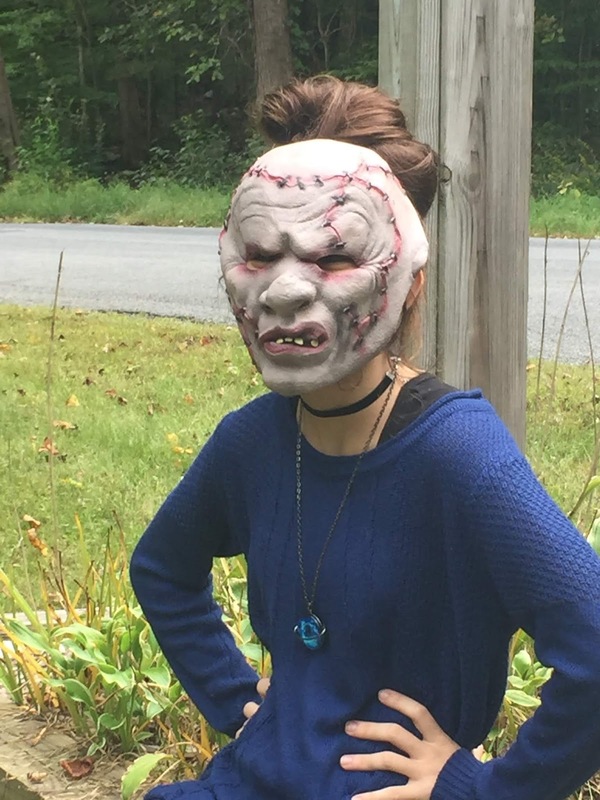 Goddess in this mask cracks me up! She looks so much younger last year.